The NYU Art Collection includes seven works on paper from Morteza Momayez’s Mythological Antic series. Momayez, best known as a practicing graphic designer, was actively involved in an influential workshop at the University of Tehran that produced posters for various political groups during the Iranian Revolution in 1979. Although this particular work dates from the artist’s days as a student in the Fine Arts Department at the same university, Momayez’s preference for a highly graphic style is evident—ink delineates the forms, and color fills their outlines. 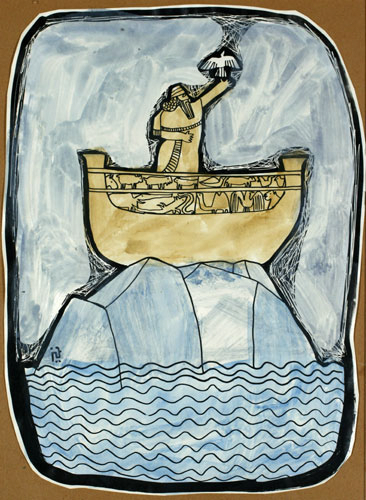 Most of the drawings in the series portray mythological characters whose precise identity is ambiguous, but Mythological Antic I seems clearly to suggest the story of Noah and the Ark. Dimensions 8 3/4 x 6 1/2 in.